The radio cab service has the brand and the customers. So why is it still running up losses? 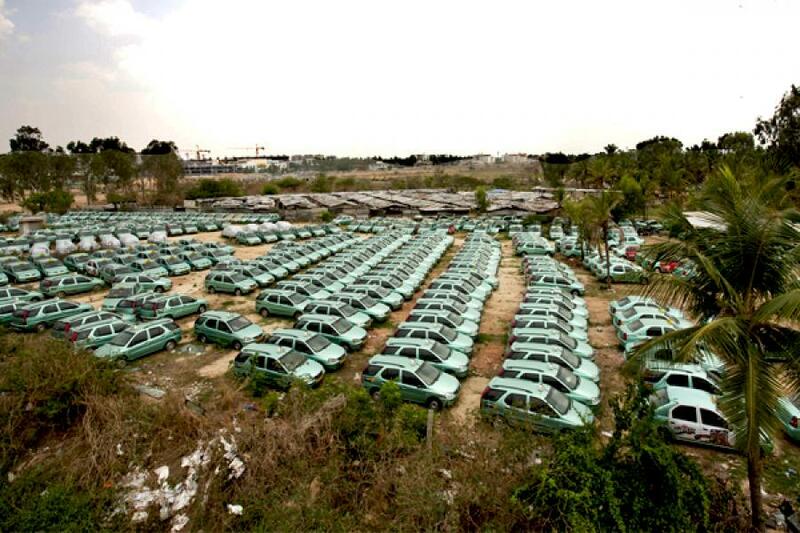 Sometime in May 2012, more than 300 Meru cabs were found lying idle in a Bangalore parking lot near Marthahalli. The number of Meru cabs plying in Bangalore is a little more than 1,000. Sources say that even 25 percent of the fleet lying idle can put the company in the red. When it began service in 2006, very few people gave Meru radio cab service a chance. Most thought it was too expensive, and would appeal only to a small sliver of the commuting market. They were all proven wrong. In just six years, Meru has become a well recognised urban experience. Customers, especially women, find it safe to travel in a Meru cab and find it easy to book one. Cab drivers who were toiling away in rickety old taxis, have signed up to drive its clean, air-conditioned taxis. It would seem then that Meru has everything—brand, customers, and good technology—to become a profitable business. That’s where it all comes unstuck. After six years, Meru is not yet profitable. It has a high attrition rate within its drivers’ ranks. “Meru is more of a venture investment. The company had zero revenues when we got in. And today we have created an entire segment where none existed,” says Divya Sehgal, of India Value Fund, the majority investor. Sehgal handles the Meru investment for the fund. Those words are true, but so are the following facts. In financial year 2010-11, on a revenue of Rs 150 crore, Meru made a loss of approximately Rs 45 crore and accumulated losses of approximately Rs 160 crore. So what lies beneath the business irony of a great brand that is losing money? Two factors: The extraordinary rate of expansion and its inability to hold on to drivers. Out of its fleet of 5,500 cabs across four cities, only 3,500-3,800 cabs are currently operational. There have been at least three incidents of Meru drivers striking work. Out of every 10 drivers that sign up with it, at least three quit and join rivals or choose to go back to conventional cabs. Cab services work at a certain critical network size. If the service is available only in limited parts of a city, it won’t gain in popularity. It won’t be financially viable either, because the fixed costs of setting up a back-office and maintenance workshops will be too high to amortise over a limited fleet size. So, the India Value Fund-backed management team at Meru built its fleet from 45 cabs in 2007 to 5,000 across Mumbai, New Delhi, Bangalore and Hyderabad. Just adding cabs isn’t enough; they need to be out running on the roads. Ronald Rosario, ex VP-operations of Meru cabs and current COO of taxiforsure.com, says, “On an average, a cab driver will spend 11 hours on the road to get at least four-and-a-half hours to five hours of a metered run.” These metered trips bring in the money. Consider the math: Meru owns all its cabs and treats the driver as a franchisee. The driver “hires” the car from Meru for Rs 950-1,250 per day, depending upon the city. Each cab is purchased on loan. So, per car, Meru spends about Rs 15,000 on EMI, another Rs 15,000 on repair and maintenance, Rs 18,000 on fixed administration services, for a total of Rs 48,000, while it gets only Rs 30,000 (sometimes less) from a driver on a fixed basis every month. This model hinges on the driver getting enough metered trips so that he can pay Meru and earn well for himself. In addition, he has to pay for fuel losses every time the cab is running without a customer. Hence, cab utilisation is key. “We did an internal study a few years ago,” says Kunal Lalani, founder and CEO, Mega Cabs, “and found that you need to do a minimum of three-and-a-half trips to be profitable in a city.” That means, three long trips (typically airport drops and pickups) and a smaller one in between. It is here the Meru’s biggest market, Mumbai, has given it a lot of problems. Cab drivers like the drop business, but the Mumbai Airport is smack in the middle of the city, so the drops are at shorter distances. This reduces earnings. Second, Mumbai has the lowest fares among large cities. The minute there is a drivers’ strike, the utilisation goes down. According to internal estimates at Meru, in Mumbai even 500 cabs lying idle will put the company in the red. Never mind if the remaining 1,500 are earning well. In Bangalore, the average distance for an intra-city travel (one way) is 10 km. Given Vij’s numbers on Singapore and New York, the business potential is between 280 and 520 km. Meru has been tweaking its business model all along for greater efficiency. Initially, the drivers were full-time employees with fixed salaries. But Meru found that the drivers were not working hard enough. So to give them an incentive, it moved to the driver-franchisee model. The fact is, most drivers want to work for eight hours and then go home. In Mumbai, there have been strikes by Meru drivers complaining of long working hours. Many say they effectively have just one non-working day in a month! So, drivers leave. And when it doesn’t work out at other cab companies, they join back. Because drivers are in short supply, they can do so easily. Meru has a team of 20 people, which only does re-recruiting of drivers who wish to join back. Divya Sehgal of India Value Fund though has a different point of view: “We don’t need to advertise in leading dailies and we’ve understood the needs of the drivers pretty well.” He and Meru CEO Siddharth Pahwa say that in all cities other than Mumbai, Meru is on its way to becoming EBIT positive. Meanwhile, Meru is planning to pare its fleet size in the near future and remove old cabs which are hitting the company with high maintenance costs. About five months ago, the management at Meru announced a new line of business, Meru Plus. Meru Plus will not own any cabs but will simply extend its brand and technology backbone to drivers who will own the cabs. This is an attempt to make the business asset-light and move to profitability. Will all these manoeuvres help Meru make money? Not unless it fixes its business model. Meru also needs to pare costs at the head office. For example, the chief financial officer’s salary went from Rs 11 lakh in 2008 to more than Rs 50 lakh in 2009—a wage increase of 354 percent. Such increases need to be justified, as it came when the company was making losses, as it continues to make now. Correction: This article has been corrected for the following errors: 1. Divya Sehgal is not a director on the board of Meru as had been stated in an earlier version of the article. 2. In 3 out of 4 cities, Bangalore, Delhi and Hyderabad, Meru is EBIT positive and not EBITDA positive as stated in an earlier version of the article. Nice blog, but i can\'t believe that after six year Merucab facing losses. Meru cab run their service in four cities and now it is a largest taxi services in Bangalore, Mumbai, Delhi and Hyderabad.Online cab booking system first launch Merucab until Meru cab suffering from loss. That is another thing in last 5 year lot of cabs companies comes in to the existence and start their service in this four major cities. Good article - The problem with Meru and other Indian Cabs is that they now have an aging fleet. Most of them started new and clean, but now are dirty and smelly. Meru needs to ensure that all cars are fresh and clean. Also for airport transfers, they should seriously consider offering shared shuttles (like innovas) to increase profitability. Offer frequent flyer programs, and tie up with travelsites like cleartrip to auto-book a car. It seems that this is a very biased view of a great organisation which provided great earning to 1000s of drivers and opened up a new sector in itself. There was a demand gap in the market which was filled by MERU followed by other companies. This article only provides a one sided view and a very biased one. I have been a regular customer of MERU for last 5 years or so and has used services in all the four cities as I am a frequent traveller. I have never found any problem with the drivers attitude or the cab condition. I have spoken to many drivers during my journeys and found out that the cars in yard come for minor/major repairs or for pending services. The cabs are interchanged and handed over to the drivers. The drivers are quite happy with what they have earned from MERU in fact a driver has named his new house "MERU Nilaya" in Bangalore. The business strategies are decided on the basis of the city and the demographics. As a Manager myself I know no company becomes profitable from day one itself and as far as my knowledge goes this company has already started making profits and will proceed in a big way in the next coming years. The primary problem confronting Meru, or anyother cab service is winning the loyalty of its drivers. The current model where the driver has to \'hire\' the cab and should in return pay a fixed amount to the company is flawed. This approach puts undue stress on the drivers as there is no guarantee of a fixed income. On multiple occassions I\'ve interacted with the drivers and this was cited as a common concern. Meru should probably look at a model that ensures a fixed income for the drivers and also focus on a more humane approach to management instead of limiting the interaction with its revenue generators - the drivers - solely at a monetary level. Focusing on retaining the drivers will serve the company good in the long run and will ensure sustained profitability. Well meru was all good until one such day the expansion was eclipsed by the labour problems and uniouns, the people suffered and he brand went missing from the streets thus hitting the recall. I wish them luck to comeover the losses and make a profit in the oming years. A union / labor problem can really bring any brand to questionable space. So the picture is like this : you never get a taxi in peak times, which makes me believe that still the business has huge potential. Your cabs are lying underutilized which makes me question, why? I think a parallel has to be drawn from Indigo\'s operational model. Is there a place for a low cost radio cab which can serve the ever growing and demanding cab service across metros? Meru has started off well with a nuanced business model of offering a professionalized hassle free service to the consumer on the most ubiquitous of all ...ie the taxi service with focus on the airport drop and pickups. But then, it seems to have lost, definitely in Bangalore( after having used it over the years, for the sheer inability to continue to connect, reinforce and maintain the basics of the business ie customer service across the touchpoints. No wonder, many a drivers, ops folks and ofcourse the customers( atleast like me), are migrating or on the verge of migrating to the other new kid on the block: Mega Cabs. As of now, Mega has proved to be a real worthy differentiator in this space; sincerely wish its not yet another short lived burst of freshness...but a steady and consistent service that is at the center stage of their business model. I have been following Forbes India from its inception in India. I personally feel form the past few months\' cover stories that Forbes India is extensively focusing companies which are not doing well. Just want to ask the editor why this Kolaveri? My personal view is that businesses are bound to face rough weather, that doesn\'t mean that we should shoot them out. Please focus on ideas, innovation and available opportunities in India. of course you can focus on failures but not a cover story please. Mr Srinivasan, Thank you for your comments. Yes, you\'re right. We\'ve had a string of tough stories on some of India\'s best known entrepreneurs on the cover, like Kishore Biyani, Sachin Bansal, Vijay Mallya and Arvind Rao. It wasn\'t part of some grand design, but pure coincidence. Having said that, Forbes India sees itself as a drama critic. If a production is good, we\'d obviously have good things to say. But then business isn\'t always warm and sunny. There are many things that go into deciding what we put on the cover. I believe there were huge, substantive lessons in entrepreneurship to be learned from each of these cover stories. Perhaps you should check out the Independence Day special edition on the stands, if you haven\'t read it already. Or even the one before on Ratan Tata\'s plunge into philanthropy. We do want to see business emerge as a force of good. And for that to happen, we need to learn to learn from both success and failure. As Winston Churchill said, “Success is not final, failure is not fatal: it is the courage to continue that counts.” You\'ll see this philosophy reflected in our magazine more often than not. Thank you for writing in. The Article doesnt seem to be of Forbes standards wherein common sense says that 2 L for a service for 1 year per car when the actual cost of the car is 5-6 Lakhs has to be a joke. Moreover it would have been better if it was compared to the services of Fast track which is a Pan tamil nadu service (Very prompt, reasonable in Price) and has become a household name across tamilnadu. One of the best service s you get on the telebooking. Hi, As somebody who used call taxis in Tamil Nadu for more than 15 years, I can tell you Fast Track is an absolutely horrendous service and cannot be compared, subject to a clean conscience, with Meru or any other service that caters to Mumbai or Bangalore residents. 1. Fast Track cars are rickety, unclean and very poorly maintained. 2. They use last-generation cars and very unsafe ones such as Maruti Omni. It is so 20th Century, you know. 3. The drivers dress and smell horribly, just like black-taxi drivers. 4. Many drivers argue with passengers and the call centre often takes the side of the drivers. 5. The minimum fare is extraordinarily high. 6. And I am not even talking about floor mats being used as seat covers. Comparing Fast Track with Meru is like comparing Vadivelu with Charlie Chaplin. Please. And I would really like to know what is this \"Forbes Standard\" that everybody keeps referring to in the gravest of ruminations while commenting on stories they want to criticize. It must be some Sergei Bubka world record, because nothing seems to be able to reach it. Hi, I am a bit surprised at your comments, it is true that fast track used to have those horrible omnis, but now they are past and the last time I had used their services in chennai it was a brand new ford fiesta. Let me tell u something drivers like to be treated as any other normal human being, showing your racist side will sure invoke their anger and there is nothing wrong with it. To let ou know that baesd out of dubai where the taxi fares are the highest you still get some smelly drivers and unkept cars. When you call up the call center there are so many hiccups as well.So it is not only with Mehru or fast track this is a world wide issue. Charlie Chaplin captured the hearts of the global audience and was a true genius in his era, whereas the Tamil speaking public consider vadivelu for their dose of humour and I must just say that it was a wrong example. Finally when a magazine of Forbes repute puts in figures which defys common sense people do tend to question the credibility of the article. I agree with Srinivasan - my experience with Fast Track in Chennai was unpleasant. It would have been better if article would have had a balanced view, In any new sector it takes time for a company to earn profits, i have had numerous good experiences in Meru. I also remember before Meru how private taxi owners used to fleece us in Bangalore. Meru has given what customers wanted. Obviously there are gaps in services which need to be filled. I am sure they will figure out profitability part. However this seems like a paid article from one of the competitors. They have no control over their fleet. Last minute cancellations are common. They also don\'t want to ply short distance - so at the end of the day the convenience/ reliability is very questionable. The regular black and white much more reliable now. Online booking is a joke. They will give you a transaction id -and then call half hour before and tell you cab is unavailable. I think your article should have covered this critical aspect - cos anyone will tell you that the brand equity of Meru given frequent negative consumer experiences is actually at a low now. These problems not unique to Meru - mega, easy etc equally hopeless. Larger story there which your article completely missed! Excellent article! One of my favourite pastimes while commuting in a Meru cab in Mumbai was to chat with the drivers and ask them about how the business was doing. They all said that Meru had started with a good mission but later became a greedy organization that squeezed the drivers dry. The per diem payment the company charged them went up from Rs. 500 to Rs. 800 to Rs. 950 in quick succession even though the number of trips a cab could make didn't increase. Meru faced problems managing the larger scale, especially when it came to the turnaround time for maintenance and repair. This directly cut into drivers' earnings even though they had to pay the full per diem franchise charge. That said, it is also true that the old black taxi mafia doesn't want modern concepts like Meru to catch on. If radio cabs became the norm, they wouldn't be able to fleece the passengers by day (side income) and engage in pimping by night (main income) and sleep at the stands most of the time. A case in point is the Mumbai International Airport, where radio cabs are not allowed in to pick up passengers. The prepaid system there charges more for non-AC cabs than Meru charges for its air-conditioned and much more luxurious cabs. Meru is losing its first-mover advantage rather rapidly and its competitors, even the less professional ones, are taking business away just because they project themselves as Meru without its arrogance! Meru is a good service, that is when its call-center executives condesend to take your booking. It is in everybody's interest that Meru eventually succeeds. But I guess it is yet another case of a company being choked by a management that is too clever by half. Apart from two factors mentioned please add one more that I experienced - Arrogance of Meru\'s telebooking staff. I once called up (good 5 hours before) to book a Meru cab for 4.30 AM to catch a morning flight. The guy nonchalantly said they don\'t have any cab at 4.30 AM and I should take 4.00 AM or 5.00 AM (if I wish to travel in Meru, Holy Cow!!) and this was on perfect winter (no heavy rains!!!) morning after putting me on hold for good 8 minutes. The next thing I did was to say \"Thanks to Meru forever\". I did get a cab at my chosen time from EasyCab and since then have either used Easy or Tab but never Meru. Hope someone from Meru reads and adds this to their woe-list. The Article is naive and narrow in its estimation of Meru's Problems and Opportunities. 1. Any new business venture that "creates" a category does face problem of "Heavy Upfront Investment" leading to long breakeven period. (telecom and retail are obvious examples) 2. The Business model is a function of customers, channel and owners' adaptability. And this only becomes clear after a sustained period of trial and error. (makemytrip and flipkart currently provide much more/different products/ services than what they started with) 3. Once travellers start accepting and adopting the services and fleet owners adjust their offerings accordingly, varied and multiple sources of income would emerge over a period of time. Lastly, they can build the brand, hook the customers and sell out to the Hertz and Aviss' of the world. The admin cost of 18,000 per car per month does seem very high. For a fleet of 5500 cars, that's 10 crores of just admin cost per month!!! On an annual basis, that's Rs120 crores - on a revenue of 150 crores? Can't be right. And if these figures are right, I really wonder what these admin costs are. And clearly, apart from the above admin costs, fleet utilisation seems to be an issue. Maybe the fleet expansion could have been gradual. Overall, a good article. Nice insights shared. @Abhishek, 18000 on administration seems fine to me considering the fact that all customer care support expense is borne by Meru. Nice article. 1 thing that feel that figure of 15000 on repair and 18000 on administration seem to be very high.these are new vehicles and spending 2 lakhs per year on repair is way too high.